I do an interview as a panelist on PL&P Magazine’s look into current trends and the future of video in shows. PL&P: Over the past few years, which widespread trend – in terms of tech, workflow, or industry relations – has had the most significant impact on your work or the video design sector in general? Drew Atienza: We are seeing more projection-based shows as you can only go so big with LED walls before running into [weight and logistical challenges], and on the creative front, you can’t wrap LED onto everything, unlike projection. To support this need to align several projectors in a time-efficient manner, we have been developing different automatic calibration methods to fit different situations and scales. In our workflow, more coordination is necessary between production, rigging, carpentry, and lighting to ensure a smooth and successful calibration plan. On another front, we are seeing more use of 3D tracking for both creative and technical needs. The information from our 3D tracking system is being used for several purposes and shared with other show departments. It can be used for generative video effects, automatic spotlight control, lighting spill control, dynamic sound control, and other location-based effect controls. This requires further coordination between departments and includes network coordination, IR tracker integration to costumes, 3D world coordination with lighting, sound, rigging, carpentry, and the creation of an accurate 3D model. Learn about “retinal resolution” and the importance of what an “arc-minute per pixel” is. What I have found most people don’t understand when it comes to defining how many pixels you need for a display is what the viewing distance is. This article does a great job explaining this in context to making a good VR/AR headset. Fremont, CA – February 2019… Arista Corporation, recognized globally as a leading manufacturer of video wall LCD displays, AV extenders, matrix switchers, AV MultiViewers, and related products for the AV installation and industrial markets, announces its Video Projection Mapping Turnkey System. Designed as a compact, all-in-one solution for projection mapping applications, the new Video Projection Mapping Turnkey System consists of two major sections: (1) a powerful video processing computer and, (2) a fully integrated transmitter / receiver cluster capable of accommodating up to sixteen HDBaseT transmitters. The entire system is pre-configured, resulting in a streamlined system that merely requires connecting and disconnecting etherCON cables to and from the projectors before and after the event. This app will make you look skinnier on the fly. Who wants to bet there will be a Notch block for this soon? Everyone wants to look their best in photos and videos. 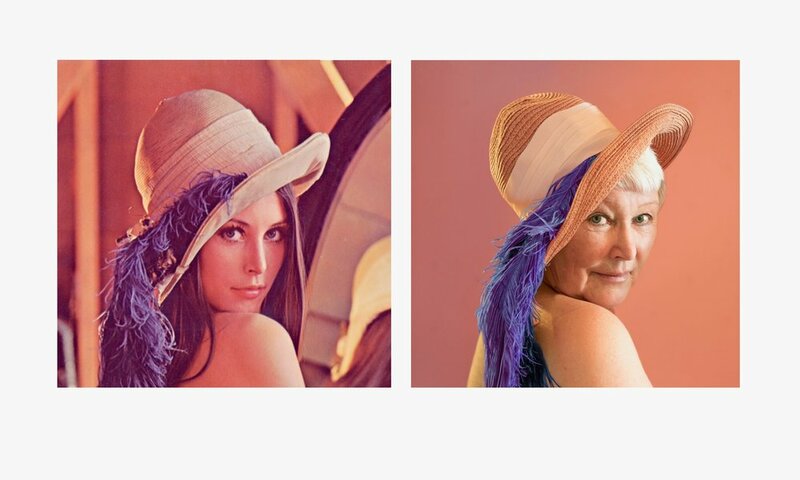 Now the world’s most valuable AI startup is rolling out a filter that instantly gives you a face and body makeover in live videos. SenseTime say their algorithms can slim down someone’s face, abs, arms and legs in real time, according to the South China Morning Post. They can also adjust the width of their shoulders or make their breasts and hips curvier. Lena’s glossy centerfold, with its complex mixture of colors and textures, was the perfect candidate. They tore off the top third of the spread, ran it through a set of analog-to-digital converters, and saved the resulting 512-line scan to their Hewlett-Packard 2100. "Virtual sets have been around for quite some time, and we've done our fair share of using them," Zac Fields said. "But it's always been a struggle to give that sense of photo realism." Fields oversees Fox Sports' Graphic Technology and Integration department, which includes the addition of new gear during a studio build. He said the team started thinking about the idea of a virtual set about two years ago. Around 15 months ago, the network started getting staff familiar with the software and began tests. Then last winter, the broadcaster did a virtual show. Fields described this as a "full run-through" of a show on the virtual set that was built in Charlotte, North Carolina. Mapping Matter - A projection study tool in your web browser! A couple of weeks ago I had the pleasure of catching up with Francois, the main man behind Mapping Matter. I’ve personally used this toolset on several jobs and it really helps when you don’t have access to a 3D software package all rigged up with a lot of custom tools for doing what is needed in a projection study. There are several new updates to check out. Manufacturer of excellent projection screen materials and other materials, GERRIETS ENTERTAINMENT SOLUTIONS, has put together a pretty cool and handy site for projection concepts. This is a great refresher or research tool to give you the vocabulary when talking about factors when selecting a projection screen material. Digital Media, Projection Design, and Technology for Theatre covers the foundational skills, best practices, and real-world considerations of integrating digital media and projections into theatre. 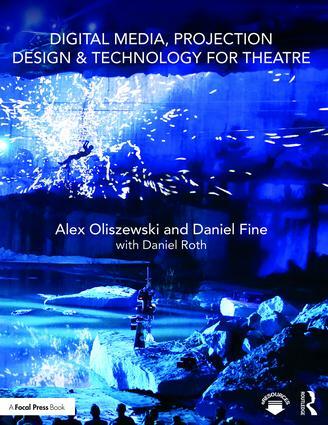 The authors, professional designers and university professors of digital media in live performance, provide readers with a narrative overview of the professional field, including current industry standards and expectations for digital media/projection design, its related technologies and techniques. The book offers a practical taxonomy of what digital media is and how we create meaning through its use on the theatrical stage. The book outlines the digital media/projection designer’s workflow into nine unique phases. From the very first steps of landing the job, to reading and analyzing the script and creating content, all the way through to opening night and archiving a design. Detailed analysis, tips, case studies, and best practices for crafting a practical schedule and budget, to rehearsing with digital media, working with actors and directors, to creating a unified design for the stage with lighting, set, sound, costumes, and props is discussed. The fundamentals of content creation, detailing the basic building blocks of creating and executing digital content within a design is offered in context of the most commonly used content creation methods, including: photography and still images, video, animation, real-time effects, generative art, data, and interactive digital media. Standard professional industry equipment, including media servers, projectors, projection surfaces, emissive displays, cameras, sensors, etc. is detailed. The book also offers a breakdown of all key related technical tasks, such as converging, warping, and blending projectors, to calculating surface brightness/luminance, screen size and throw distance, to using masks, warping content and projection mapping, making this a complete guide to digital media and projection design today. Watching the below behind the scenes video, I was pleasantly surprised to see a lot of familiar faces from the SIA camp. What I really like about this ad is that it wasn't all CGI, they used a TON of practical effects. I believe that live entertainment is getting a bit dry with just a ton of screens around the stage. Make something like a practical effect on stage and it ups the wow factor. An interesting video and read from WIRED for those that do not know what LiDAR is. As car technology develops this young technology, I can see it used in the future for the stage environment. As most automation systems do not actively "know" where an object is (it is inferred based on the 3D model being accurate, encoder feedback and nothing in the real-world being different or out of place in the 3D model), LiDAR could be used as a way to double check that everything is where the system believes it is. This system could be used as a safety check or "automated e-stop" if anything is out of place from what the automation system believes should be happening. I also believe once a system has been developed for the stage, this could feed into projection mapping, lighting, and sound systems as another way to do tracking. There are other technologies out there for 3D "real-time" analyzation like 3D Photometry (Like the TESLA uses), but you will still need something that translates those images into what it is seeing. The author, Richard Cadena and I spoke about how to keep your media server programming skills sharp and where to look for inspiration. Read more below. If you are in the Los Angeles area, come to VER (company I work for) LED & Media Server Open house on February 22, 2018 from 4pm to 8pm. Please RSVP HERE. We’re hosting an open house celebration for our friends and clients at our LA LED facility, featuring the latest equipment, and the VER team behind it. Take a tour of the LED facility, get hands-on equipment demonstrations, grab a drink, and enjoy some delicious food and entertainment. The enhanced structured light scanning technology of HPs’ 3D scan solutions creates precise 360° 3D models of even the most complex items. The Walt Disney Co. may be looking into how to give theme park visitors powers, much like "the Force" in Star Wars or the various powers possessed by Marvel superheroes. Behind any successful project is good production design. In this article, find out what that means and how to incorporate it into your next project.